The Yorkshire Three Peaks Challenge, a 25-mile walk over the holy trinity of Yorkshire’s mountains, Pen-y-ghent, Whernside and Ingleborough. After leading a group of six friends from work on a series of nine practice walks over a period of five months in readiness for this it was finally time for us to tackle the Yorkshire Dales Three Peaks Challenge. Apart from the challenge our aim was to raise as much sponsorship as we could for mental health charity selfharmUK. We posted our entry slips through the letterbox of the Pen-y-Ghent Cafe at 6.35am and set off in high spirits to start the first climb of the day – Pen-y-Ghent via Brackenbottom. The forecast for the day was for sunshine and showers with the possibility of thunder storms at midday. A few nice patches of sunshine over Moughton as we set off lulled us into a false sense of security for by the time we’d passed Brackenbottom Scar the cloud had begun to close in and it began to rain. I’ve been on Pen-y-Ghent in some fairly awful weather and this was no exception. The wind picked up driving the rain into us and soon we were all soaked. There was so much water that it was literally pouring down the steep final path. With the weather so bad and with so much more of the walk to do we stayed just long enough to get a couple of photos before trying to get off the summit as quickly as possible. Although a long section of the walk I’ve always rather enjoyed the stretch between Pen-y-Ghent and Ribblehead, the ground underfoot is generally good (now that Black Dub Moss has been bypassed) and it allows you to get into a good walking rhythm. As we made our way north up Ribblesdale the skies once again began to break up and brief patches of sunshine appeared. Indeed by the time we reached Ribblehead it was beginning to look most promising indeed. Meeting us at Ribblehead was our support person Pat who had a car boot full of pies, pasties, sausage rolls, crisps, chocolate bars and some of my wife’s delicious homemade flapjack. Refreshed and energised we next turned our attention to Whernside. A long gradual climb it is a bit of a slog compared to the more interesting but more time consuming route via Force Gill. By the time we’d got half way up the group had split up with three well ahead, three struggling a bit and me in the middle trying to keep an eye on everyone. Just a I got caught up the leading group at the summit the cloud closed in again obscuring the views. Having waited ten minutes I went back to look for the others who soon appeared out of the fog. There was time for just another couple of pictures before we once again began our descent. The next section, the descent to Bruntscar, is in my opinion the hardest part of the walk. The ground is steep and I don’t like the uneven steps which were made even more treacherous due to being wet and slippery. Fortunately we all made it down in one piece and even better the cloud was beginning to lift from Ingleborough and the there were some nice patches of sunshine. Unfortunately this didn’t last. After meeting up again with Pat near the Old Hill Inn for further refreshment we began making our way across Southerscales towards Ingleborough. The summit remained clear of cloud until we reached Humphrey Bottom when the weather deteriorated rapidly. 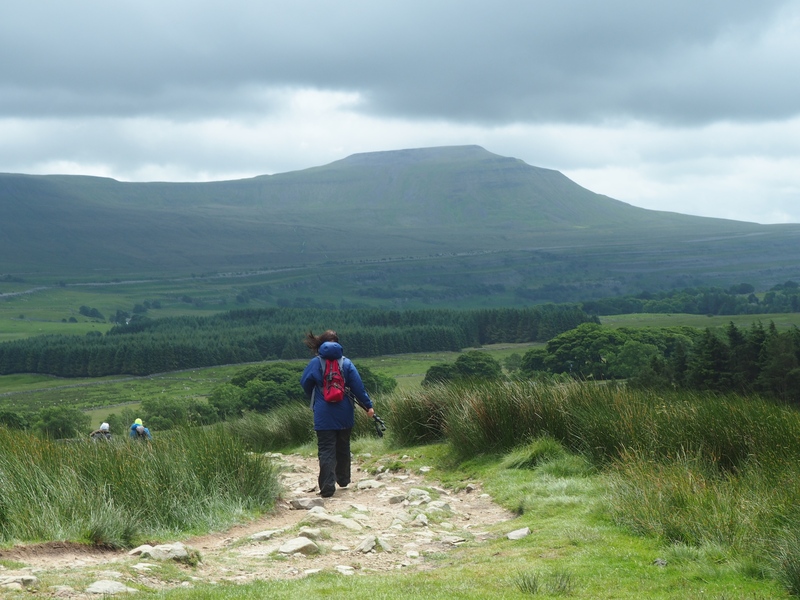 The ascent of Ingleborough is really the final challenge of the walk and the team did it in very difficult conditions. Having got themselves up the steep path we then had to fight our way into the wind and rain to the summit shelter. Due to the thick hill fog this only materialised when we were about ten feet away from it. As with Pen-y-ghent I risked the camera to get a few photos before we beat a hasty retreat. While it would have been nice to have enjoyed a few moments of triumph, as well as some views, on Ingleborough I think everyone was almost in a state of shocked exhaustion as we made our way off the summit. As we gradually worked our way down out of the cloud and began the long walk back to Horton this gradually wore off to be replaced by a justified sense of satisfaction and achievement. We finally made it back to Horton to clock in at the cafe at 5.52pm giving us a time of 11 hours 17 minutes. After celebrating with a plastic cup of Châteauneuf Du Pape we made our way back to Harrogate tired but happy to enjoy further celebrations (and cocktails!) at Lucia. This blog has inspired me sort of? Now I never thought I would say this but I want to do the three peaks now? Do it get all the tired mess out the way just to make me happy please pa pa?